Rescuers are working to find at least 30 people who disappeared after an avalanche in Italy. MILAN, Italy -- An avalanche buried a four-star spa hotel in a mountainous earthquake-hit region of central Italy, leaving at least 30 people missing, authorities said Thursday. The civil protection agency said that they were working to get rescue vehicles to the Hotel Rigopiano through roads covered in snow, joining initial rescue efforts overnight by alpine rescue teams. The ANSA news agency quoted a rescuer as saying that there were fatalities, but details weren't immediately available. A 6.6 magnitude earthquake strikes Central Italy. Italian media said that the avalanche covered the three-story hotel in the central region of Abruzzo on Wednesday. The hotel is about 45 kilometers (30 miles) from the coastal city of Pescara. Earthquakes hit the region on Wednesday, including one with a 5.7 magnitude, but it wasn't immediately clear if the temblors triggered the avalanche. Raw video from Italian media shows the aftermath of a violent earthquake Tuesday in the nation's center. Mountain rescue teams reached the hotel by skis around 4 a.m. (0300 GMT), SKY TG24 reported. Video footage showed rescuers with shovels digging through a wall of snow, and at least one man being led through the cleared path. An ambulance was blocked several kilometers from the hotel, according to SKY, which also said that snowfall was so heavy that snow plows have had trouble clearing the road to the hotel. At least 73 dead after deadly earthquake in central Italy overnight. ANSA quoted rescuers as saying they have been calling out to survivors, but no one has responded. But media have reported that two people had been rescued. 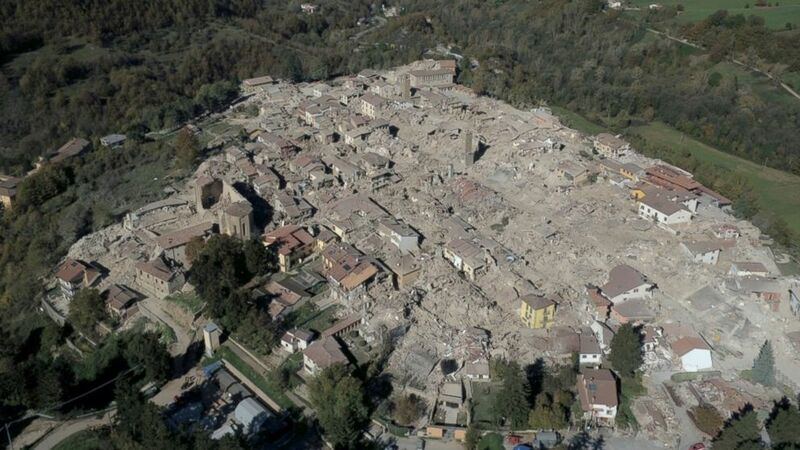 The mountainous region of central Italy has been struck by a series of quakes since August that destroyed historic centers in dozens of towns and hamlets. A deadly quake in August killed nearly 300, while no one died in the strong aftershocks in October largely because population centers had already been evacuated. In the meantime, the entire region has been hit by cold weather and buffeted by snowstorms, piling more suffering on to the hard-hit population. People left homeless by the earlier quakes had been moved to hotels in the region, but it wasn't immediately clear who was staying at Hotel Rigopiano, which is located in the Gran Sasso National Park. The hotel posted on its Facebook page Wednesday morning after the first quake that its telephone lines were out. In the hours since the report of the avalanche, users have been posting messages seeking information about the hotel. The quake was centered about 82 miles northeast of Rome.